I GENERAL CRITIQUE. 1. Programmatic Arguments. 2. The Problem of Representation. 3. Consequences of Encodingism. 4. Responses to the Problems of Encodings. 5. Current Criticisms of AI and Cognitive Science. 6. General Consequences of the Encodingism Impasse. II INTERACTIVISM: AN ALTERNATIVE TO ENCODINGISM. 7. The Interactive Model. 8. Implications for Foundational Mathematics. III ENCODINGISM: ASSUMPTIONS AND CONSEQUENCES. 9. Representation: Issues within Encodingism. 10. Representation: Issues about Encodingism. 11. Language. 12. Learning. 13. Connectionism. IV SOME NOVEL ARCHITECTURES. 14. Interactivism and Connectionism. 15. Foundations of an Interactivist Architecture. V CONCLUSIONS. 16. Transcending the Impasse. References. Index. 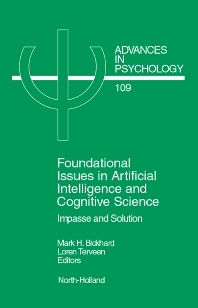 The book focuses on a conceptual flaw in contemporary artificial intelligence and cognitive science. Many people have discovered diverse manifestations and facets of this flaw, but the central conceptual impasse is at best only partially perceived. Its consequences, nevertheless, visit themselves as distortions and failures of multiple research projects - and make impossible the ultimate aspirations of the fields. The impasse concerns a presupposition concerning the nature of representation - that all representation has the nature of encodings: encodingism. Encodings certainly exist, but encodingism is at root logically incoherent; any programmatic research predicted on it is doomed too distortion and ultimate failure. The impasse and its consequences - and steps away from that impasse - are explored in a large number of projects and approaches. These include SOAR, CYC, PDP, situated cognition, subsumption architecture robotics, and the frame problems - a general survey of the current research in AI and Cognitive Science emerges. Interactivism, an alternative model of representation, is proposed and examined.